Parks planning meeting set for Wednesday at City Hall. 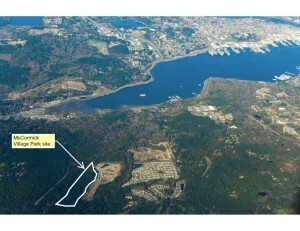 Planning for a 63.5-acre public park in the McCormick Woods-Sunnyslope area advanced Tuesday, when the Port Orchard City Council approved a contract with a Seattle architectural firm that will help citizens develop a master site plan for the park. Money for park development, including professional consultant services, came to the city as a result of annexation of the McCormick Woods urban growth area last year. The county had collected $643,732 in development impact fees to cover the planning and creation of the park, and the money was transferred to the city under an annexation inter-local agreement. The city now is responsible for developing and maintaining the park on Old Clifton Road. Jones & Jones Architects and Landscape Consultants of Seattle will lead the planning process. A meeting with the McCormick Village Park subcommittee is set for 7 p.m. Wednesday at City Hall. The city is paying the award-winning design company $40,000 for its services. All citizens of Port Orchard, not only those on the park committee or in the McCormick Woods area, are invited to weigh in on planning for the park, said development director James Weaver. Park committee meetings, listed on the city’s website, www.cityofportorchard.us, are open to the public. The committee will meet through September. The city will conduct public hearings about the committee’s proposals through December and adopt the park plan before the end of the year. Construction on the park will likely begin in September 2011. Information on the park can be found on the city’s website or call the planning department at (360) 876-4991. Adoption of Resolution No. 020-10, Approving the Design Review Board’s Recommendation for Proposed Development at 710 Bay Street: Will the city council give the go ahead to the first development project to come through under the city’s new Downtown Overlay District plan? The plan was intended to promote tasteful development in the downtown core. The council last month got hung up on how Swenson’s plans would work with the marquee and needed a month to think about it. Landscape Architects, Ltd., for the design of McCormick Village Park: Things are moving forward with planning for a planned 63.5 acre public park in the McCormick Woods/Sunnyslope area. Master License Service: By working with the state’s Department of Licensing, the city hopes to make the process of reapplying for a business license smoother and more efficient. Presumably a benefit to both the city and business owners. I will check on that. The Kitsap Regional Library is accepting donations to help the Port Orchard Library replace more than 1,300 children’s books that have disappeared from that branch in recent months, prompting an investigation by the Port Orchard Police Department. The value of the books is worth an estimated $22,900, roughly 20 percent of the branch’s collection. There are no new leads in the case, which has been assigned to a detective, Chief Al Townsend said Wednesday. The books disappeared a few at a time over the past few months. Since circulation was up in January and February, staff did not immediately take note, said Branch Manager Kathleen Wilson. The foundation has established a special account to benefit the Port Orchard branch, which shares its collection within the entire KRL system. Donors should designate their intention in a note or on their check, stating “Port Orchard Branch picture books” or “POB pic books,” said Foundation Director Peter Raffa. The foundation will direct all donations over the next two months toward replacement of the collection, even without a note, Raffa said. Donations are tax deductible. Send them to KRL Foundation, Sylvan Way Library, 1301 Sylvan Way, Bremerton, WA 98310. We have reported today on a Washington State Patrol report that Port Orchard Mayor Lary Coppola was arrested early Sunday morning on suspicion of driving under the influence of alcohol. We will be posting an update shortly, which will include a statement from the mayor. In other news from City Hall, Coppola recently posted his Mayor’s video report for April on the City’s Web site. His topics: Puget Sound Regional Council’s Vision 2040; the joint lease of Given’s field recently approved by the city council for South Kitsap Western Little League and South Kitsap Pee Wees; a new business opening in downtown; the opening of the Port Orchard Farmer’s Market; a recent meeting of mayors from around the state; YMCA Women of Achievement representing South Kitsap; more hints about a new grocery coming soon to downtown PO; online utility bill payment; and plans to reprise Paint the Town (according to the mayor, Delialh will again be contributing significantly toward the effort), this time with a focus on the waterside buildings. Coppola dedicated about two-thirds of his video to Vision 2040’s transportation element, known as T2040. He explains his take on the plan’s potential impact on economic development in Kitsap County and the region. Coppola was one of only two members of the PSRC executive board to vote against T2040 on March 25, primarily because of tolls. Seattle Mayor Mike McGinn was the other. Coppola said he wants Port Orchard citizens to be able to get in and out of town without having to pay tolls or a vehicle-miles-traveled tax. “Many of the ideas advanced in the Vision 2040 plan may be acceptable and actually pragmatic for King County and the I-5 corridor, but we (not clear if he’s talking about the city of Port Orchard or mayors of the county) strongly question the validity of what amounts to a King County soluntion being forced upon the rest of us,” he said on the video. Coppola also talks about the importance of the region investing in technological infrastructure to promote telecommuting, which would reduce impact on roads, bridges and ferries. Kitsap Regional Library’s library levy PAC announced Friday on its Facebook page that there had been a “cordial” meeting between library officials and Port Orchard Mayor Lary Coppola. This after Coppola criticized the library board at a PO city council meeting Tuesday, and in media comment sections after, for allocating $750,000 to Port Orchard’s library, when multimillion dollar buildings are planned for Silverdale and Kingston. Silverdale’s new library has been in the works for many years and is planned for the Silverdale Community Center. The current library is deemed too small for the population it serves. Kingston’s library is a room in its community center, which is in severe disrepair. Port Orchard plans to build a new library in a planned Town Center Revitalization Project, which will include a parking garage, retail spaces and a public plaza. Library spokesman Jeff Brody agreed that Port Orchard’s library, which is 8,000 SF and serves 21,000 patrons each month, is a high priority as well. Before Friday’s meeting, he said that more money will likely be available to Port Orchard and other branches after the two new buildings are paid off in six years. The time has come, members of Port Orchard City Council’s tourism committee said Tuesday, for the committee to expand its duties to include economic development. To date, the committee has focused mainly on working with the Port Orchard Chamber of Commerce, nonprofits and local businesses on special events that draw visitors, such as the city’s Chimes and Lights Festival, the Seagull Calling Contest and last summer’s Cedar Cove Days. Paying more attention to economic development would be a natural progression, said committee chairman Jerry Childs. Committee members, including Childs, Jim Colebank and Fred Chang, have been looking at cities like Poulsbo and Leavenworth as models. Childs said the committee would coordinate with Mayor Lary Coppola, who so far has been the city’s designee and spokesman in attempts to attract new business. Coppola has already hosted some focus groups with selected business owners. One of the committee’s ideas is to host an economic development page on the city’s Web site with information on permitting and other resources related to economic development. The Port Orchard Chamber of Commerce has a resource page for prospective and current businesses, but, said Chang, it’s not the committee’s intention to reinvent the wheel. One business owner willing to take a gamble on Port Orchard is Melinda Brown and her partner Shane Makoviney, who will open Melinda Lee’s at 810 Bay Street on May 1. Shane is a clock repairman; Melinda is an artist and gardener. Their store will offer a potpourri of artwork, garden starts, gifts and sundry supplies that would be useful to boaters. Lee is bullish on Port Orchard. She sees a positive momentum in the downtown mix of stores despite the economy. “We love Bay Street and believe in it and believe in what it could be,” she said. Of course Port Orchard business extends outside the downtown district, and the committee will pay attention to those folks as well, Chang said. So what should city government do to make the city a business friendly place? Parking you say? Right, it’s on their to-do list. What are your other beefs, worries or needs? Take the survey on the homepage. Parents and players with South Kitsap Pee Wees turned out in force Tuesday before the Port Orchard City Council. Members of the youth football club were anxious about the upcoming renewal of a Givens Center ball field lease they hold jointly with South Kitsap Western Little League. The lease expires at the end of April. The council will discuss renewal of the joint lease at a work study meeting April 20th. They’ll vote on the lease April 27. The council on March 9 allowed the Little League club to assume the lease from South Kitsap Babe Ruth, which folded early in March after 50 years in operation. According to an e-mail distributed to Pee Wee members and local media on March 29, some Pee Wees were worried the city intended to boot them off the field, which they have shared with Babe Ruth for a number of years. Apparently it was like that game of telephone we used to play as kids, where players sit in a circle and whisper a message in the ear of the person next to them. By the time the message goes full circle, it’s usually pretty well mangled. The flames may have been fanned by a dropped word typo (since corrected online) in a weekly publication’s article on the shared lease. What the mayor did say at the March 9 meeting, in his characteristically blunt style, is that if the two clubs can’t get along, they’d both lose the lease. The city has had to referee conflict between Babe Ruth and the Pee Wees in the past, and Coppola was having none of it from the new arrangement. “What I told them then and what I’m telling you now is, you will make this work and you will get along with Pee Wees or you’ll both be gone,” he told Bob Showers of Western Little League. On Tuesday, officials from both organizations vowed to cooperate with each other as they share the field, even though their respective needs may sometimes conflict. Pee Wees reseeds the field after their season, for example, but the grass may not be far enough along to play on by the time Little League holds tryouts in early spring. All part of the details they’ll have to work out. “I don’t think you have to worry about us not working together again. We’re all here for the kids,” said Pee Wees President Chuck Burns. Alas, much ado about nothing. The Pee Wees’ passion for their program (which includes basketball and cheer) was clear from comments made by parents and coaches on Tuesday. Single parent Dorothy Williams said Pee Wee football was a godsend to her and her sons, one of whom landed a full-ride scholarship to play football for Eastern Washington University. “I don’t know what we would have done without it,” Williams said. Basketball coach Ron Smith said Pee Wee programs give kids who may not make the cut on school teams a chance to get in on the action. Those of you with property in downtown Port Orchard may want to mosey over to the Kitsap Caucus for a look at a map of FEMA’s designated flood zones, downloaded from the City of Port Orchard’s Web site. The map relates to a post I made about business owner Rudy Swensen and his plans to renovate his building at 710 Bay Street with a New Orleans theme. Swensen has to pay a hefty premium on a small business loan he secured because the building is in a flood zone. Flooding in 2007 is part of the reason for the renovation, he said. Looking back on this era in “Newspaper” Web site development, we will no doubt see it as a time where experiments were undertaken, certain noble ideas stuck to the wall … and others didn’t. Alas, our hopes of being able to host videos of Port Orchard City Council meetings have been dashed, because of our respective technological support systems’ inability to communicate. We recently underwent an upgrade in our video uploader, so it no longer accepts the format in which Port Orchard produces its videos. Henceforth, I’ll be posting links to the City’s Web site as a reminder that the videos are available. Here’s the link to the March 23 council meeting (my apologies for the delay). Among business at the meeting, the council approved new rules for use of the Active Club. Animals are no longer allowed in the building.